Brellas are a main weapon type introduced in Splatoon 2. Brellas fire narrow cone-shaped spray of ink each time the trigger is pulled. If the player holds down the trigger, the brella will unfold, providing a protective shield that will absorb enemy attacks. The shield can be broken if enough ink is fired at it. If the player holds down the trigger even longer, the brella will detach from the main weapon and propel itself in the direction it is aimed, inking the ground as it travels. It will still protect anyone behind it from enemy fire until it vanishes, but the shield will be disabled for a short time after it's launched. After being launched, the shield takes half the normal damage from enemy attacks. The shield absorbs Rainmaker shots, taking damage from them but not allowing them to explode. This is not the case for bombs, which will explode on impact, dealing damage to anything in front of the shield. The shield is unaffected by Object Shredder. No additional damage will be dealt. Sting Ray and Ink Storm ignore the shield, dealing damage directly to the player. A released shield can break Ink Armor and Sprinklers on impact. A released shield will break if it touches a Splash Wall, another brella shield, or the Rainmaker shield. 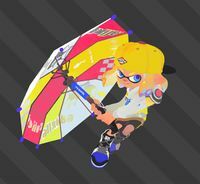 The Brella's winning animation is holding an open umbrella above them if they are an Inkling and playing it like a guitar if they are an Octoling. There are no Brellas with the Point Sensor or Toxic Mist as their sub weapon.